I already use RMarkdown/JupyterNotebook. How can Stencila be useful for me? Stencila allows you collaborate with colleagues who use other tools than RMarkdown and Jupyter Notebook, without you having to give up your favourite tool. Stencila Coverters make it possible to open documents in various formats (R Markdown - Rmd, Jupyter Notebook - ipynb and so on) in Stencila. The conversion is lossless for all interactive parts (such as code cells). Soon the Converters will also support conversion back to the original document. You can open the file in your tool of choice and see the changes your collaborator made. Stencila&apos;s interface provides editing environment similar to that of Word and Excel making it a low-entry barrier for collaborators unfamiliar with RMarkdown or Jupyter Notebook. Stencila keeps track of the dependencies between the code cells supporting reactive programming. This means that when you change a particular value, other bits of code which depend on it, will get automatically updated. Note, that this feature can be disabled and you will be able to re-run code manually. With Stencila you can have interactive code cells in different programming languages by enabling various execution contexts. The data can be passed between the cells through the data interchange feature. These two features combined with the conversion between formats means that researchers with different skillsets can easily collaborate on the same document using their preferred programming language. I don&apos;t write any code for my research. Is Stencila for me? Yes, definitely Stencila is for you! Stencila allows you to write your papers just like you would do it in a popular text editor (MS Word or similar) but you can save it directly in a format commonly used by publishers JATS Journal Article Tag Suite giving you more control over the formatting of your manuscript. 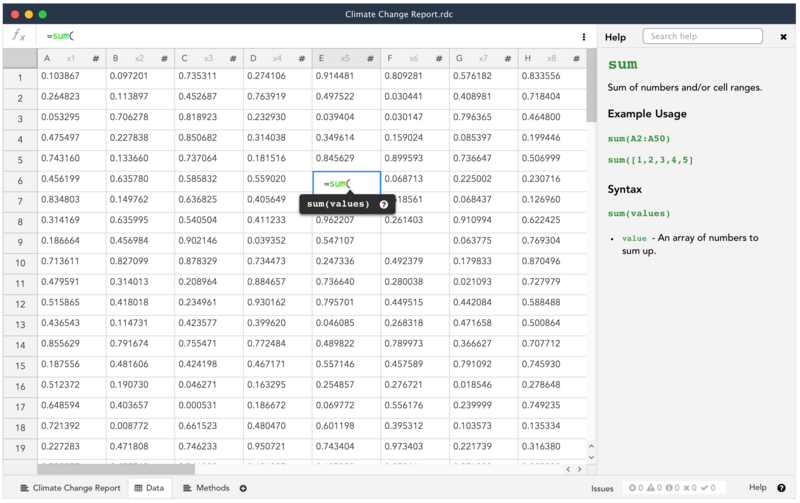 Soon Stencila Converters will allow you saving your document in formats compatible with other popular reproducible research tools (such as Jupyter Notebook) creating more opportunities for collaboration. Stencila Sheets provide a way towards working within an environment similar to spreadsheet software but supporting reproducible approach by linking sheet directly to the article allowing for capturing the analysis steps. Stencila will tie together the data in the spreadsheet, the methods you used to process the data and the researchers publication. Stencila Sheets will make it possible for extending the spreadsheet functionality by registering functions written in other programming languages. Using simple Stencila API researchers can wrap up functions written in R, Python and other languages, register them and thus make them available through the Stencila Sheet interface. I would like to try out Stencila but don&apos;t want to (or can&apos;t) install the whole suite on my machine. What can I do? You can use Stencila Hub. The Hub hosts interactive Stencila documents with different execution contexts enabling collaboration and previewing Stencila Sheets and Articles. If you would like to access Stencila Hub, please contact us. Error message No peers able to provide.... means that there is no active execution context for the language you are trying to use. In this particular case, if you want to use R, Python or SQL within Stencila, you need to make sure you enabled the relevant execution context. See the installation instructions for details.